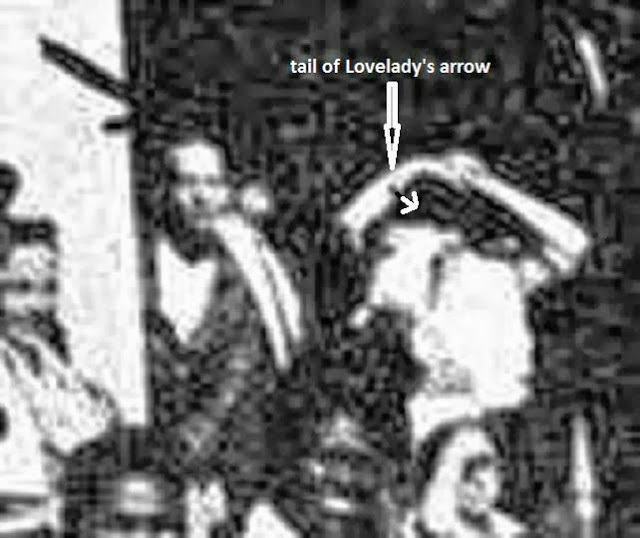 Oswald in the Doorway (not) : the blog of the Oswald Innocence Campaign,debunked by Lance Uppercut: I can't stop laughing! UPDATED! I can't stop laughing! UPDATED! Wasn't gonna be posting again today but I can't let this one go! Nice post from Mr "You can't mark the area of examination"! Hard to type for laughing! Have a read of this Ralph, and thanks for making everybody's day! And by the way, where did that god - awful copy copy of CE 369 come from? Jesus Ralph, can anybody really be this stupid? You draw in a black line and a white arrow which isn't there and then attempt to claim you didn't mark the "area of examination"? You see, what you found was a black speck, and added a black line and a big white arrow to it to suggest that that's what it is. When you take away your arrow you've got a black speck. And...where does that terrible copy of CE 369 originate from Ralph? Don't you love the way Ralph tries to make that arrow bend toward his "Black Hole Man" but if you throw a straight line on what he calls the tail it goes straight to elbow guy? Bravo! This is all I can type, am laughing so hard my wife thinks I'm crying !!!! "Are you reading Ralph again?" she says.